This report studies the global mice model market for the forecast period of 2016 to 2021. This market is expected to reach USD 1.59 Billion by 2021 from USD 1.11 Billion in 2016, at a CAGR of 7.5%. The global mice model market is segmented on the basis of type, technology, application, service, and region. The report also provides a market for mice care products, by type. By type, the mice model market is categorized into inbred mice, genetically engineered mice, conditioned/surgically modified mice, hybrid/congenic mice, outbred mice, and spontaneous mutant mice. The inbred mice are estimated to account for the largest share of the market, by type. However, knockout mice models are expected to be the fastest-growing market segment owing to high investments in the development of new and innovative knockout models and the popularity of CRISPR as a major gene editing tool. By technology, the market is segmented into CRISPR, microinjection, embryonic stem cell injection, nuclear transfer, and other technologies. Other technologies include genetically modified sperm-mediated gene transfer, virus/vector mediated gene transfer, liposome-mediated DNA & electroporation of DNA, biolistics, and TALENs & ZFN. In 2016, CRISPR technology is expected to command the largest share of the market. The market is further segmented by application, which includes oncology studies, immunology & inflammation studies, diabetes studies, cardiovascular studies, central nervous system studies, and other disease studies. Other disease studies include rare diseases, renal disorders, toxicology, and hematopoiesis. In 2016, the oncology segment is expected to command the largest share of the market. 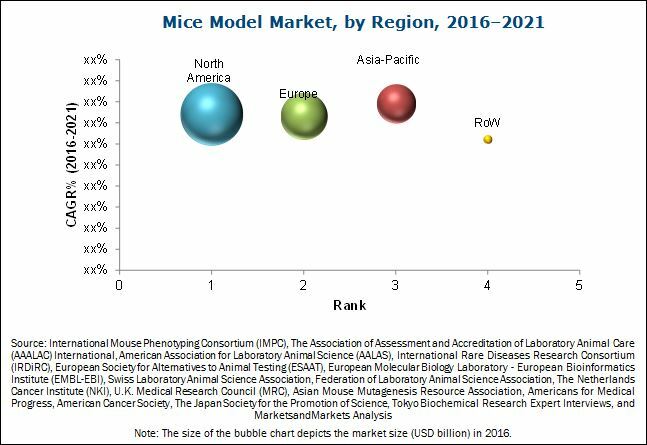 The mice model market, by service, has been segmented into breeding, quarantine, rederivation, cryopreservation, genetic testing, model in-licensing, and other services. Other services include surgical, line rescue, and in vivo pharmacology services. In 2016, breeding services are expected to command the largest share of the market. The market also covers the mice care products market, by type, which includes bedding, cages, feed, and other products (gnotobiotic equipment, water systems, and accessories like washing systems, logistics, water purification systems, and sound absorption panels). In 2016, cages command the largest share of the global mice care products market. On the basis of region, the global market is divided into North America, Europe, Asia-Pacific, and the Rest of the World. In 2016, North America is poised to account for the largest share of the market, followed by Europe and Asia-Pacific. However, the Asia-Pacific market is expected to grow at the highest CAGR during the forecast period. Ongoing innovations in mice models, the popularity of humanized mice models, continuous support in the form of investments and grants, and growing R&D activities of pharmaceutical industries are some of the factors that are expected to drive the growth of the market in the coming years. Charles River Laboratories International, Inc. (U.S.), The Jackson Laboratory (U.S.), Taconic Biosciences, Inc. (U.S.), Envigo (U.K.), Laboratory Corporation of America Holdings (U.S.), JANVIER LABS (France), Harbour BioMed (China), TRANS GENIC, Inc. (Japan), genOway (France), and Horizon Discovery Group plc (U.S.) are some of the key players in the market.